Ear-pleasing music characterized by an only apparent lack of motility. Within the extent of the orchestral palette (especially wind instruments, piano and percussion), fascinating ideas and propositions for further in-depth experimentations are introduced. The temporal contrasts and the overall kinetics are thoroughly impressive. The score that originated the “outrage” is nothing but an utterly brilliant exploration of timbre not too distant from the serialist principles, its percussive echoes also reminiscent of Edgard Varese’s sonorities. A proof, if ever it were needed, of the prevailing academic backwardness which to this day asphyxiates innovation to privilege the obvious. What seems to justify Kayn’s scores since the very beginning is his clear attempt to render the orchestra as a self-regulating entity. Long instants close to silence repeatedly break a light-and-shadows, long-and-short actuality; in synthesis, there is a contrast between the sense of fulfillment given by a masterful distribution of voices and the shock caused by a crescendo that stops suddenly, perhaps to give way to an uneven outflow of short, multicolored notes. At the outset we are figuratively taken by the throat: a strong, vociferous dissonance of brass and strings is kept for a long time to unwrap a gradual order of visible layers, similarly to the slow blossoming of a flower. The piece is straightaway definite on both harmonic and dynamic levels; the chromatic choices are astounding, yet never conveying the idea of “special effects”. We just can’t remember such a powerful statement – a fist banged on a table, in a way – from any composer of the same era. Germs of far-flung atonal/Stravinskian rootage crawl inside an orchestra ready to be infected; the music that gets spread around is compelling, replete as it is with character and brains. The emotional states experienced during the listening act are tangible, dissonance seemingly affirming its total supremacy without further uncertainties. The blend of orchestral timbres is inordinately multifarious, the surprises within the piece’s status quo always around the corner. Just see the abrupt “rebellion” of strings and horns against the immovable power which, in any case, remains the foundation of this masterpiece. Top-grade orchestral Kayn stands right here. A nearly sinister composition revolving around the interchangeability of “outbursts” and quieter sections that, in any case, never warrant absolute calmness. A prominent low-frequency percussive crescendo frequently appears to set the playback environment in veritable quaking mode. Electric guitars mixed with pizzicato strings also seem to be a part of the equation. This is music of prodigiously strong imagination, amazing as ever in comparison with what was expectable at the time: kaleidoscopic, thrilling, revolutionary in its own special way. Any conception of “color” is by now remote, replaced by momentum and character. Music comparable to a chemical reaction, highly differentiated within the single cells that shape it. Strings and percussion represent the carriers inside the dynamic alternation (ranging from silence to fortissimo) providing movement to the wholeness. Improvisational “ghosts” are detected: Kayn already seems to have in mind the basics of that concept of self-determination which will color the upcoming cybernetic marvels. All of the above seems to depict a perfectly operative democratic organization. A rainfall of pizzicato strings that later on stretch all around their technical/tonal range, once again mainly supported by percussion and wind instruments. In a free expression of objective perception, the musicians seem involved in a ball game-like interaction, the reciprocal questions and answers always leaving margins for muteness and unagitated breathing. Voices and percussion constitute the piece’s backbone, apparently “theatrical” and disorganized but – on the contrary – finely structured. Here more than anywhere else one can envisage a relative nearness to Edgard Varese or, alternatively, to selected vocal works by Luciano Berio. The schemes across which the musicians shift are outlined with disappearing ink… But are there – in fact – any schemes, aside from the fleeting intervals separating the different blowups? 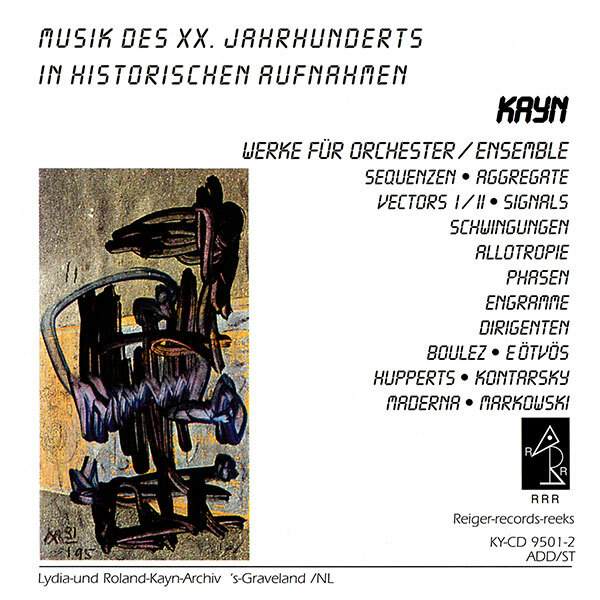 A feature almost always missing in Roland Kayn’s output is the idea of a tonality. “Engramme” is a classic example in that sense: the composition is consecrated to the total exploitation of an orchestral compass evoking icons, snapshots, opinions, ruminations and clipped shards… but never a genuine tonal architecture. Even the sections typified by a more “approachable” contrapuntal level appear as mere pretexts, introductions of sorts to concepts arbitrarily thrown in the air to be caught and apprehended right away in order not to stray from the dictates of a fundamental path. The call of a single instrument in the most rarefied sections urges to keep going without losing heart; repeated listens reveal a plurality of forms and hues, gradually rewarding the recipients of those “secret codes”. The Lydia and Roland Kayn Archive offers copies of this release for sale in our shop.